Coming to Kickstarter April 10, 2018 at 3 p.m. EST, Zombicide: Invader will be the sixth stand-alone entry in the Zombicide franchise that has spanned the adventures of countless Survivors across different time periods. This new story takes place years in the future in the far-off reaches of space. Across the entire Zombicide journey, the thing that has remained constant is the series’ development team: Raphael Guiton, Nicolas Raoult, and Jean-Baptiste Lullien. We got a chance to talk to them about the history of the game, and why Zombicide: Invader is the most exciting entry yet! How long have you been working on the Zombicide franchise? R. GUITON: We’ve been working on Zombicide since early 2011. The core ideas were developed fairly quickly, but it took months to wrap up the whole game and get it ready for both Kickstarter and production. We had been working together for a long time already and wanted to stay on the same path. Since then, we’ve worked on separate projects, but Zombicide has kept us together over the years. Tell us about the backstory behind this new installment. R. GUITON: In Zombicide: Invader, space travel and alien encounters became a reality. The only thing needed to reach distant stars is a proper engine, and humans just found a new kind of fuel on a remote planet for that engine. The government has sent a task force to extract the resource, but they failed to prevent a “gold rush.” The thing is, humans are not the only ones wanting the new fuel. Other species are on the planet for the same reason, and communication is difficult. One day, one of those species, called the Xenos, became infected. All of a sudden, they started to attack strangers on sight and cover everything with an organic substance nicknamed Mold, turning the facilities into their new home. That’s where Zombicide: Invader starts. Players control Survivors of the initial Xenos assault, on the frontline of a new war. They don’t know what to do next, except find safety in numbers… and weapons, of course. Lots of cool weapons. What makes Zombicide Invader unique? J.B. LULLIEN: Weapons! Wait. Xenos! Wait. The tiles! Wait. Many key features set Invader apart from previous Zombicide games. While many game mechanics were kept, we altered a few of them, and introduced some exciting new ones. The first major change was the setting. Invader takes place in a mining station on a distant planet. Many people came for a gold rush, then the Xenos, an alien species, got infected by something nasty. They come from the deep to turn the station into a hive, and kill everyone on sight. The Survivors come from a military or technical background, meaning they have specific skills and abilities. Soldiers are tougher but cannot find equipment as easily as the Civilians do, for example. Facing them, there are Xenos inspired from classic zombies, with a few twists. The bigger ones come first in targeting priority order, meaning the whole horde is harder to destroy. Luckily, the survivors can concentrate fire to eliminate the big ones even with small caliber weapons. It’s a challenge, but it can be done. Plus, the Abomination is way more dangerous than any Abomination created thus far. It’s faster, smarter, and turns the station into a hostile Xeno nest. Did I talk about machines yet? There are sentry guns. And robots. Yes! How big of a role does the location itself play in the game? N. RAOULT: The location, an extraterrestrial mining facility, plays a pivotal role. Obviously, it’s a whole different graphic setting with a significant impact on the ambiance. Rule-wise, the new features have a specific impact on the game play. Survivors cannot walk on the planet’s surface without an equipped oxygen tank. The lack of oxygen also means bullet-fed weapons don’t work outside the station. In my opinion, the most important aspect is the lack of buildings to open. It’s all about working rooms, corridors, and open passages. In Invader, there are a few closed doors. The Xenos come from the outside in bigger waves, and players have to think with the mining station's configurations to fight their way to victory. How long have you had the idea for a Zombicide instalment in space? R. GUITON: We wrote our first design notes two years ago, as we were also working on Zombicide: Black Plague. The project was still somewhere in our minds, but we kept nothing from the initial ideas in the final game! R. GUITON: We developed Invader for five months. There was quite a lot of fun work to do, over several boxes. I can’t say too much at this stage. We hope everyone will enjoy the invasion! Will fans of the series be able to pick up the rules quickly? N. RAOULT: Yes. The core mechanics are largely the same. Although, we’ve made a few tweaks in the overall game that have made a noticeable impact. We did our best to represent the new rules in the game’s graphics, so they are logical, fluid, and intuitive. Reading the rules will be quite fast. Over the years, the fans of the Zombicide series know where to look to find the changes. While the rules are familiar, the game experience is very different. What will be the biggest difference for fans of the Zombicide series? J.B. LULLIEN: The environment, certainly. Players were used to walking on streets and in villages, seeing zombies coming their way, and having to open buildings to escape. In Invader, there are no buildings to open, per se. Survivors roam in the mining station from one room to the next, and corridors are usually short. Some missions also require going outside the station in oxygen-deprived environments. There, everything is dramatically different, from lines of sight to the weapon you use. You really feel like you’re in a hostile environment. Of course, every version of Zombicide is someone’s first, so what about Zombicide: Invader makes it a great starting point for those new to the series? N. RAOULT: All Zombicide adventures share some mechanics, refined over the years to get more and more intuitive. These rules are flavored by specific aspects inspired by each era (classic, fantasy, sci-fi), providing a unique experience with each game. Zombicide: Invader is designed with replayability and compatibility in mind: going from one mission to the next is done in a few minutes. All you have to do is adjust the tiles and tokens to fit the map and go for your next objectives. With a couple games under your belt, designing your own scenarios is easy, adjusting the parameters to fit your audience and intended ambiance. The range itself offers many ideas to expand your game in near infinite ways. And, ultimately, Zombicide: Invader is a cooperative game with solid, intuitive rules. You may play with your family and friends, getting the core material to evolve into your own space opera! What was the most difficult new element to introduce? N. RAOULT: Mold! The Mold is the organic substance the Xenos use to turn the mining station into their hive. It comes in the form of tokens covering the different Zones and has special properties. Mold affects lines of sight, walls, destroys any token it covers (missions can be lost!) and, most of all, may spawn Xenos. The name really fits, it’s a nuisance. The Spoiler Abomination’s rules tie in closely with Mold, as they spread it around the station. Mold proliferation with Abomination spawn and movement was the most challenging feature to balance. Are these new enemies more difficult than the standard earthbound zombies? J.B. LULLIEN: They are basically more difficult to beat than regular zombies, BUT survivors have the weapons and new rules (i.e. concentrate fire) to eliminate them. They attack in different ways, and benefit from specific Xenos rules, like the Mold. The most important change comes with the Spoiler Abomination. It’s not just a looming menace or harder zombie: it’s a real boss and a constant threat! Can you tell us more about the new Spoiler Abomination? J.B. LULLIEN: The Spoiler Abomination is a tough customer to deal with. It spreads Mold in any room or corridor it walks through. To be more specific about its abilities, the Spoiler Abomination spawns as usual with Xenos cards AS WELL AS anytime players don’t have enough miniatures of a given Xenos type to spawn on the board. Moreover, it gets an extra activation every time an Abomination card is drawn, and there are more of the latter than in previous Zombicide games. The cherry on the top of the slimy cake is that it deals Damage 3. The Spoiler Abomination is unpredictable, fast, omnipresent, and corrupts anything it touches. It is a true boss in every aspect. Was it difficult to come up with the aesthetic design of the Xenos? R. GUITON: It was the other way around, in fact. 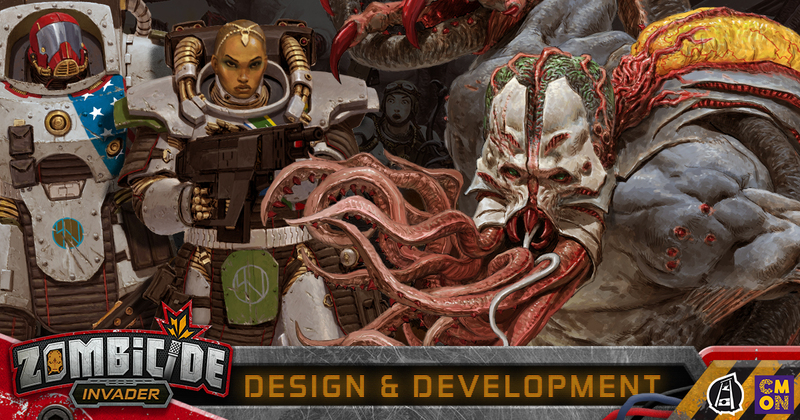 The aesthetic designs for the Survivors and Xenos were created before the rules. We defined the environmental design of the game and it was quite fun to do. We agreed really quickly about the overall feeling we wanted to give to the players: a clean mining station on a lonely, hostile planet, getting tainted by a Xenos invasion. What was your favorite element to work on? R. GUITON: The environment. It’s such an important part of the fun for me. It has to be unique and immersive. J.B. LULLIEN: WEAPONS! The gameplay experience also relies on the equipment you find, and I like to test various, exotic, weird, and deadly weapon combinations. N. RAOULT: Meta-game. I especially love to create and define artificial intelligences fit to the audience and environment. Stay tuned to the CMON and Guillotine Games Facebook pages for all of the latest news on Zombicide: Invader as we count down to the April 10 launch of the Kickstarter. Read our Zombicide: Invader Gameplay article here. Read our Zombicide: Invader Survivors article here. Read our Zombicide: Invader Equipment article here. Read our Zombicide: Invader Xenos article here. Read our Zombicide: Invader Environments article here.